Every summer, we receive frequent phone calls from householders concerned about bees. “We’ve got a swarm of bees in the garden, bees in the chimney or roof, bees in the shed, bees in the compost heap, bees in the bird box, bees in the lawn, bees burrowing into the house walls. We are worried that the grandchildren, the neighbours or the dog might get stung”. Our advice is always the same: Live with the bees if you can, and be glad that they have chosen your garden. We need more bees, and they are very unlikely to sting. Most probably these are bumblebees. How lucky you are to have these nesting in your garden! The birds no longer need the nest box, and it is just the right size for bumblebees, and too small for honeybees. Just enjoy watching the bumblebees coming and going, busy pollinating the flowers in your garden. 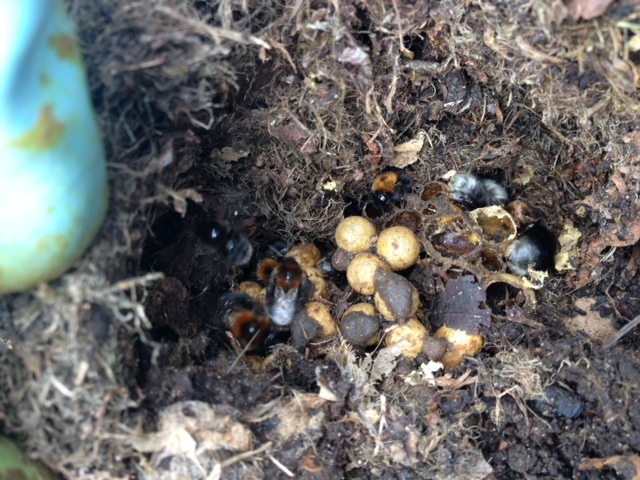 Note: Our members do not remove bumblebee nests. These probably are honeybees. If they have only just arrived in the chimney (May or June) you might be able to drive them away by lighting a fire in the fireplace. If they have been there more than a day, they will have started to make honeycomb and they will be impossible to remove alive. We know of houses that have had honeybees in the roof for decades without any problems. We always encourage householders to live with them. Our members do not climb onto roofs in search of bees. These may be honeybees, but are more likely to be wasps. Wasps make a paper nest, with the entrance at the bottom. Honeybees make parallel beeswax combs, and you will see the bees on the combs. Wasps can be a nuisance, but they help the gardener by eating aphids. The nest can be destroyed with a wasp spray, obtainable from any hardware shop. Wait until evening, when the wasps are in the nest. Squirt the spray into the entrance. Next day, remove the dead nest. These are probably bumble bees. We need more bumble bees. They are very important pollinators of fruit and vegetables. They work at lower temperatures than honeybees, and they should never be destroyed. If necessary, make a new compost heap elsewhere. Only the queen lives through the winter. Click here for more information on bumblebees. These are probably solitary miner bees. Click here for information. These are probably masonry bees. 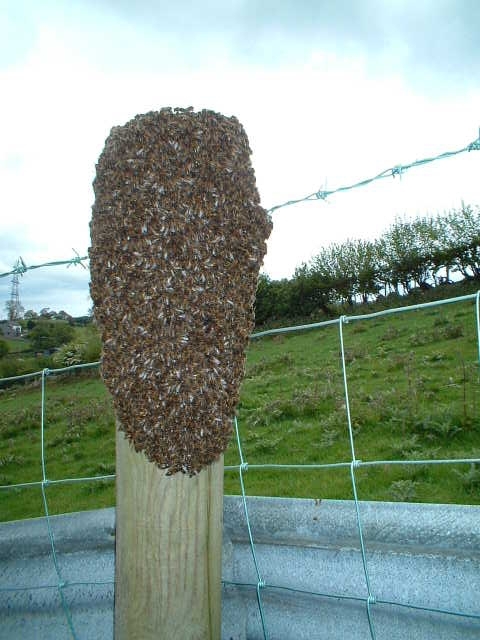 This swarm has landed on the top of a fence post. Swarming is how one colony of honeybees increases to two colonies. On a chosen day, usually around mid-day, during May/ June the bees “swarm”. A cloud of bees in their thousands leave home for the last time. The mother queen leaves with them as they seek their fortunes further afield. As mother queen has not used her wings, for flying purposes, for at least 12 months or indeed seen the light of day outside the hive during this time she is reluctant to fly very far, so she alights usually within a short distance of leaving home, and all of her daughters surround and protect her, while the “scout bees” search for a new home. This may be in a hollow tree, or sometimes the eaves or roof void of a house or the chimney. It is at this stage that most non-beekeepers panic, as a cloud of bees invades their property. Don’t panic! Swarming bees are intent on one thing only–looking for a new home and not seeking to sting anyone. Within a few minutes the queen will have landed and the worker bees will follow her into their new home, or will form a protective ball around her, if she has settled upon a branch, wall etc. A phone call to your local beekeeping association. is usually the next step as most beekeepers are on stand-by for swarms, and will either collect the swarm or advise upon any possible problem, e.g. where they have settled in a chimney. A swarm being hived. 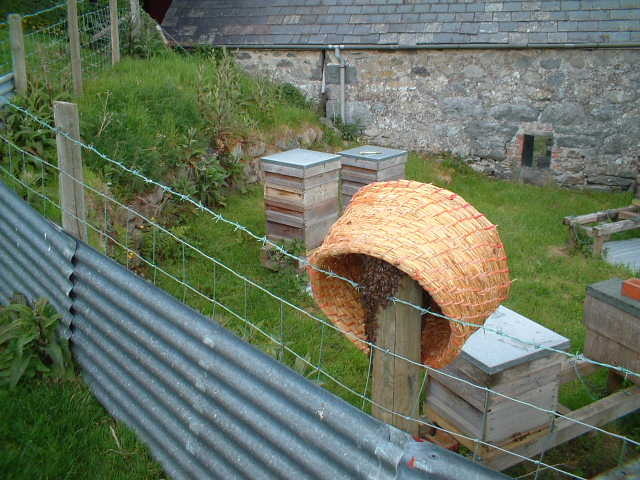 The bees are shaken from the skep onto the sheet. They soon walk up into the dark entrance of the hive. You could of course consider yourself extremely fortunate to have such a gift arrive on your property. Become a beekeeper and provide yourself, your family and friends with a welcome product–pure honey. An added bonus, if you take this route, is that you will have joined the ranks of beekeepers, and from then on enjoy a hobby that will captivate you for the rest of your life. 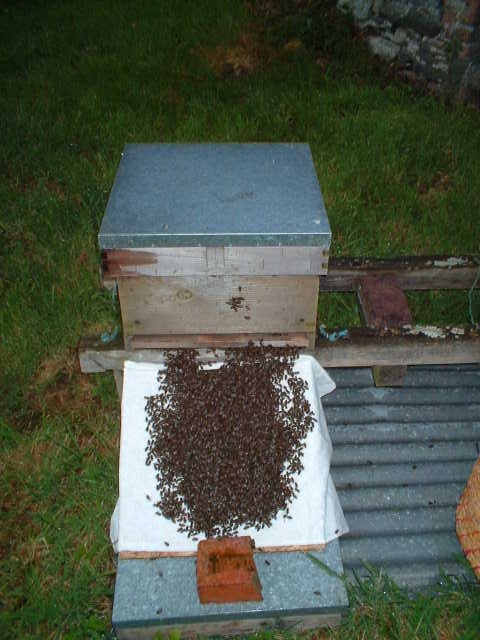 A list of honeybee swarm collectors in North Wales is here. They will not normally travel out to advise on other types of bees. Beekeepers may make a charge to cover travelling expenses.